The mystery building is half of the Centennial Towers, developed by Myers Development and designed by Skidmore, Owings & Merrill. One question's answered, another's asked in Curbed SF's construction watch for readers, by readers. You ask, we pass. Got an answer to one of these queries? To the comments! Or the tipline! Wondering about some urban carnage? Let us know. 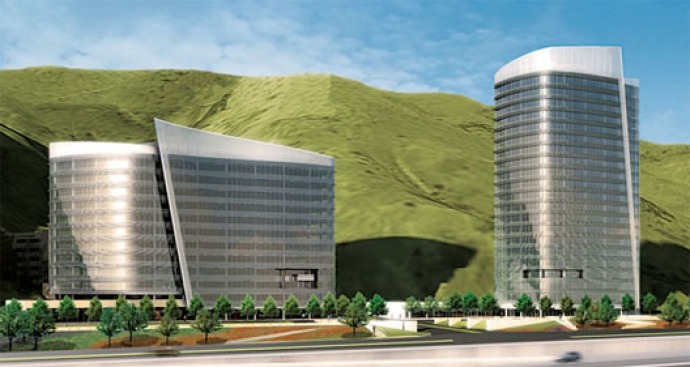 SOUTH CITY: What's that lonely office building at the foot of San Bruno Mountain in South City? It's half of the Centennial Towers, developed by Myers Development and designed by Skidmore, Owings & Merrill. The taller tower of Phase II was iced in November, and word is Phase I will be struggling for a while to get tenants. At least most of you seemed to like the design. SOMA: And a new question: What's the story with 48 Tehama? A reader points us to a funkalicious design by BAR Architects that they call "sustainable and visually striking," but "not trendy." The 19 floors will house a hotel, offices, and residences. There's also an older design for 48 Tehama by KTA Architects. Likely nothing happening anytime soon, but we wonder who the mystery developer is.